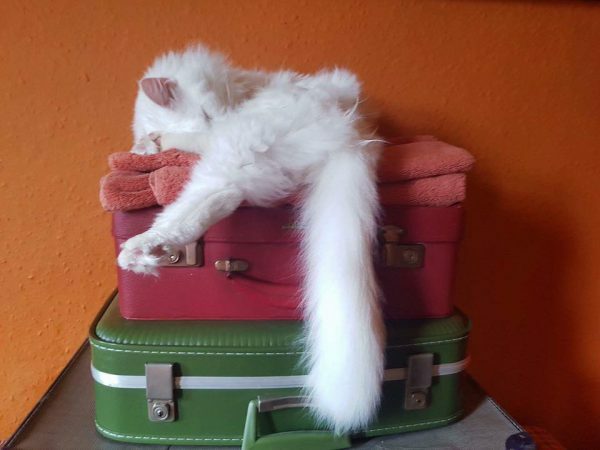 Here are some tips to help your pets cope with moving… part 1: packing and travelling. On a practical level – remember to update your contact details on microchips, tags, pet passports, etc. – as well as with your pet insurance company and your local vet. If you’re moving a significant distance, remember to find a new local vet and get all your pet’s details transferred. Updating the tag is something you can do easily, and may choose to do before moving day in case your pet wanders off during or post transit. Your pet’s belongings and foodstuffs – if you can pack these last do. In particular pack bowls/bottles last so that your pet can have a drink upon arrival, as they will likely need one! If you have a designated area in your home for your pet and will do so in your new home, this can all be packed last so your pet can chill whilst you pack up, and then unpacked first so your pet can begin to settle whilst you move the rest of your stuff in. • Allocate one person (if possible) to be in charge of your pet – checking on them at regular intervals during the move to ensure they’re doing okay. • Ensure the removal company staff know where your pet is and how their belongings are to be transported – i.e. any of your pet’s things that are to stay with your pet and not be packed deep into the removal van you should make the removal co. staff aware of. • Pheromone sprays and collars are very beneficial to a distressed pet – companies such as Feliway and Adaptil provide such items for dogs and cats (for more information please click here for Feliway and here for Adaptil). • Animals can be placed into carriers with a familiar scented item (current bedding rather than fresh, blanket or owners item of clothing, etc). • Placing a blanket or towel or sheet over the carrier can also help in keeping your pet calm. • Ensure pets in carriers have something to keep them occupied if they so wish – you don’t want chewing of carrier bars (potentially damaging their teeth/gums) when you could provide a chew toy to keep them occupied. • Ensure your pet is secure in transit; whether this means entrusting someone responsible to holding the carrier, or fitting the carrier safely into a vehicle, or ensuring your dog’s seat-belt is secure and he can’t get to anything he shouldn’t whilst on the move – make sure your pet is safe and secure. A big pet peeve of mine is people who have dogs loose in the car – not only is their jumping about distracting to you and other drivers, even a small dog (say 5-10kg in weight) can cause serious damage to you if you have an accident and the dog is thrown into someone – not to mention the injury the dog will sustain by being unrestrained! We wear seat-belts to avoid injury if we were to be involved in an accident; its the same principal – secure your dog. • If you ware moving far away and the journey is long – remember your pet would enjoy a bathroom/ water break and a leg stretch. Ensure that any exercise is done safely and with your pet on a lead – your can get harnesses/leads for dogs, cats, rabbits, ferrets and more. To follow: I will cover moving with fish, amphibians and reptiles, and once you’re in your new place.